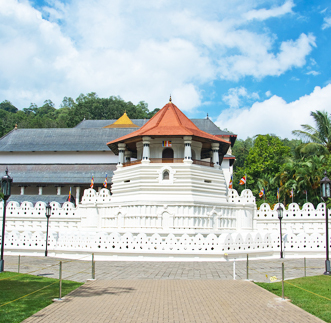 After breakfast embark on a city tour of Kandy along with visiting the Royal Botanical Gardens. and Bakkers Falls] Evening at leisure. Overnight stay at 3* hotel in Kandy. Leisurely after breakfast, you will be dropped off in Colombo. Transfer Time: Approx. 1.5 Hrs. 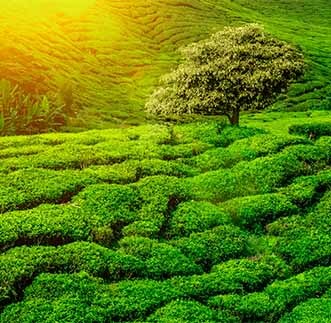 Kandy is a convenient base to stay for a few days while exploring the Cultural Triangle as there are comfortable hotels to suit every budget. The city is easily accessible from Colombo by rail, road and float plane. Minneriya National Park. Sitting in the centre of the cultural triangle, Minneriya is a good alternative to the busier parks in the south and it's easy to weave in a day here between visiting the ancient cities. 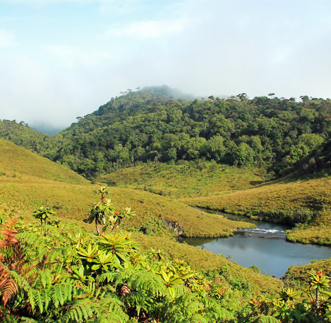 The dry season, preferably from June to September, is the best time to visit the 8,890 hectare park when the ancient tank, the lake that dominates the area, dries out and the grasses and shoots push through. 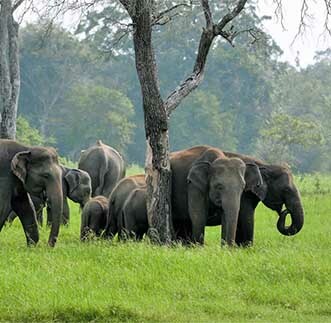 During this time it is possible to see herds of up to 150 elephants feeding and washing, as well as toque macaques, sambar deer and leopards. The hungry bird flocks include cormorants and painted storks. 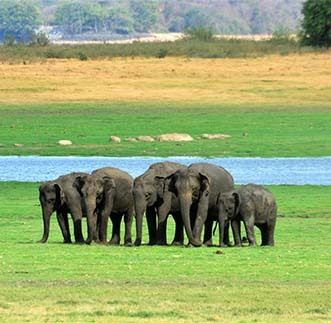 Minneriya, closest by car to the ancient city Polonnaruwa, was upgraded from a nature reserve to a national park because of the increased number of tourists coming to see the elephants. 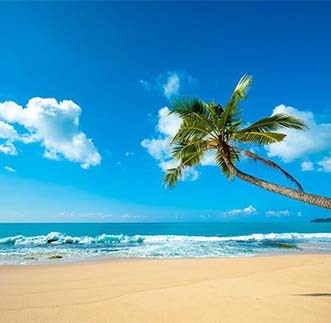 Bentota, 62km south of Colombo, is a planned tourist development. It has a long broad sandy beach, at its best during the October to April holiday season, with safe swimming – although red warning flags fly when currents are too strong. There are some fine beachside hotels, which also have swimming pools, as well as guest houses to suit all budgets close to the carefully planned developed area. All the services a visitor requires (banks, post office, tourist shops, restaurants, a railway station) are available and the area has an atmosphere of respectability. 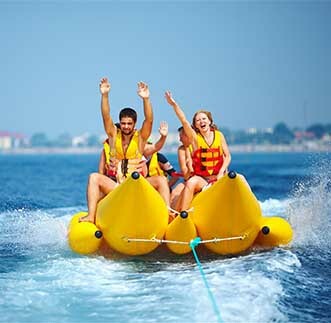 Guests have evening entertainment in the beachside hotels and there is plenty to see on day tours from the area, such as cruising on the Bentota river, visiting the two private gardens of Brief and Lunuganga, or indulging in water sports since Bentota has a reputation as being the water sports capital of Sri Lanka. Called by many names including “The Lion Rock” for its initial name of “Sinhagiri”, Sigiriya is near the town of Dambulla and is a colossal column of rock nearly 200m high. It was a royal citadel for 18 years (477-495) when it was fortified by King Kasyapa. 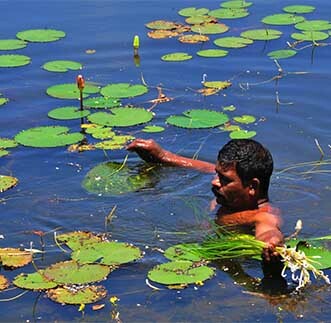 The architectural and irrigational technologies of Sigiriya, such as the Water Gardens, still baffle engineers. The climb up steep steps of metal with railings passes a wall decorated with frescoes of bare-breasted women. Art experts consider them unique. The summit of the rock is a hectare in area and the outer wall of the palace was constructed on the brink of the rock with gardens and ponds softening the harshness of the eerie. Since it was constructed over 1,500 years ago, it is claimed by enthusiast as the Eighth Wonder of the World and is anyway a World Heritage Site. King Kasyapa selected the rock as the capital for his kingdom due to its strategic point when fending off invaders. A gateway in the form of an enormous lion was built and thus gave it the name Lion’s Rock. However after the death of the king the capital and kingdom were abandoned by its people and it served as a Buddhist monastary until the 14th century. 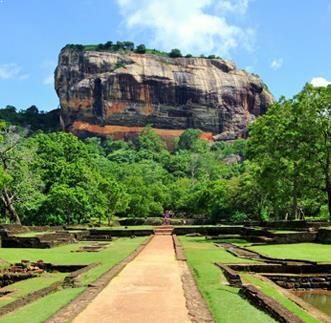 The frescoes are probably Sigiriya’s most popular attraction. The whole face of the wall has been used as a picture gallery which to this day have been preserved. 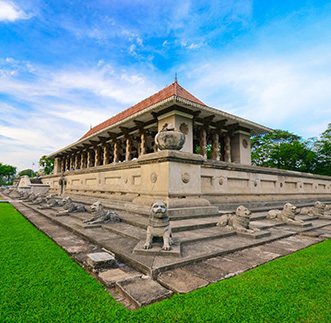 The paintings are said to have been of the Anuradhapura period. However the style of painting is unique to that of any found in Anuradhapura during its golden years. Package rates based on per person sharing a Double/Twin Room in USD. Accommodation at the 03 star hotels in the Standard Room category. Transportation in an Air Conditioned Coach. Services of an accompanying English Speaking National Guide. 02 complimentary bottles of 500ml mineral water per person per day. Meals and beverages not included in the package price. Tips & Expenses of personal nature. Travel Insurance, Air Fare & VISA. Check in time at hotels will be at 14.00 Hrs. and check out is at 11.00 Hrs. Minimum of 10 pax required to operate the tour. No refund for unused services on tour. Confirmation of the tour required minimum 20 days prior to arrival. Cancellation informed less than 15 days prior to arrival will be charged full cancellation. Cancellations informed 15 days or (more), prior to arrival will be charged 50% cancellation. Cancellations informed 31 days prior to arrival, will be eligible for a full refund. On-line payment using a personal credit card (Amex/Visa/Master). Log in details will be sent on confirmation.